SACRAMENTO, Calif.— The Center for Biological Diversity notified the U.S. Fish and Wildlife Service today of new research revealing that the western pond turtle is actually at least two species, each of which is therefore more endangered than previously thought. Because of threats like water pollution, introduced species, disease and overcollection, the study reaffirms, federal protection is urgently needed for the turtle, which is included in a 2012 Endangered Species Act petition filed by the Center. Western pond turtle photo by James Bettaso, USFWS. This photo is available for media use. Using multiple analytical methods and data sets, the researchers revised the taxonomy of western pond turtles to identify two new species. All populations north of the San Francisco Bay area and populations from the Central Valley north (including the apparently introduced Nevada population) are now known as Emys marmorata. 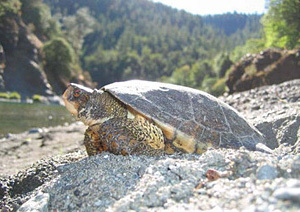 Turtles in the southern portions of the range — the central coast range south of the San Francisco Bay and the Mojave River — are described as Emys pallida. Turtles from Baja California are tentatively also considered Emys pallida, but these animals may represent another distinct species pending results from additional analysis. The Center — along with several renowned scientists and herpetologists including E.O. Wilson and Thomas Lovejoy — petitioned for federal protection for the western pond turtle and 52 other amphibians and reptiles in July 2012. Thereafter, more than 200 scientists sent a letter asking the Service to review the status of the petitioned animals. The agency is required to make an initial finding within 90 days of receiving a petition about whether protection may be warranted, but more than a year and a half later it still has not acted. Western pond turtles are found from western Washington south to northwestern Baja California. The name “pond” turtle is something of a misnomer because this species more frequently lives in rivers and spends a lot of time in terrestrial habitats. Western pond turtles are highly opportunistic eaters and will consume almost anything they can catch and overpower. These turtles are declining in abundance rangewide, especially in the northernmost part and the southern third of the range. The animals are listed as state endangered in Washington, sensitive/critical in Oregon, and a species of special concern in California. But none of these state laws confers effective protection of habitat. An upper respiratory disease epidemic in Washington in 1990 left a total population of fewer than 100 western pond turtles in the state. They are essentially extirpated in lower Puget Sound, and only two populations remain in the Columbia River Gorge. In the Willamette Valley in Oregon, western pond turtles appear to have declined to a level that represents roughly 1 percent of historic levels. In California’s Central Valley, where most of the natural habitat has been eliminated, surveys detected turtles at only 15 of 55 sites with sizable populations only at five sites. Pond turtles from Southern California are in precipitous decline, with few stable, reproducing populations known between Los Angeles and the Mexican border.